We're sorry, reservation times are not available online for a party of this size on the selected day. Please call us at 603-873-4833 and we will see if we can accommodate your party. Welcome to Oak & Grain! This Spring you can still enjoy our three course prix fixe dinner with options for each course Wednesday, Thursday and Sunday evenings. This is a perfect option if time is limited. Seatings are offered between 5:30 and 9pm. There is no formal cocktail reception or presentation, but feel free to come early and get cozy by the fire! Our Three Course Dinner is $55 per person, not including beverages, gratuities, or NH state tax. Fridays and Saturdays are reserved for our signature five course prix fixe menu. A cocktail reception begins at 6:15pm and the chef presents the menu at 7pm. There is always a choice of three entrée options. Our menu changes nightly to take advantage of all our farm partners have to offer seasonally. Each night's menu is carefully crafted to present an exceptional blend of flavors and textures. The table is yours for the evening so come prepared to relax and enjoy! $65 per person, not including beverages, gratuities, or NH state tax. Wine pairings offered from $36-$38 per person. Sunday mornings we offer an inspired Sunday Brunch! Come at 11:30 for cocktails, our three course Brunch is served at noon. $35 per person, not including beverages, gratuities, or NH state tax. Stay tuned for some exciting special dinners coming up! Please be sure to include your Guest Type (required by Oak & Grain). Newsletter: By selecting any of the following options, you agree to receive communications from Oak & Grain. We do not share your information with any 3rd parties. You can withdraw your consent at any time. Please call the inn to reserve a table for more than 6 people. A credit card will be required to hold the table. A deposit will be taken for tables of 12 or more. Stay personally connected to Oak & Grain with your free preferences profile. You'll have convenient access to Oak & Grain's news, promos and special events! And Oak & Grain can get to know you better with automated communication. Happy Mother's Day! Mother's Day Brunch begins with a cocktail reception at 11am, followed by Chef's presentation at 11:45 followed by the seating. Plenty of free parking available on-site. 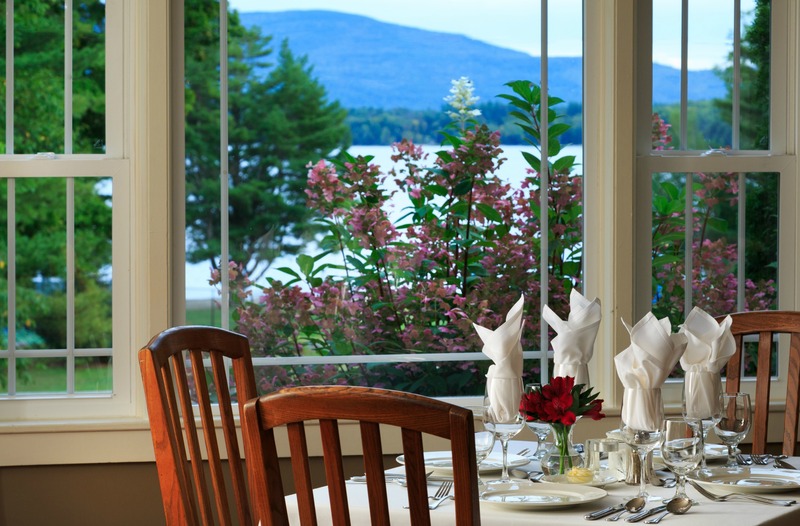 Oak & Grain is located at the Inn at Pleasant Lake on the north shore of the Lake. From the center of New London, take Pleasant Street to the bottom of the hill. The entrance is off of Knollwood Road.